Oppo for the past month kept themselves busy with teasing the release of its follow up to the N1 and today at an event in Singapore, they revealed the N3. A few days ago, the company also teased a secondary device which turned out to be the super slim R5. Last year, Oppo unveiled the N1, an interesting smartphone that had a swiveling camera on the top. This time around, Oppo refined the N1 to produce this year’s N3 smartphone. The company did a great job at tackling what many thought was the N1’s main issue, its size. Oppo shrunk the display size to 5.5 inches and made the phone shorter, lighter and slimmer for a much better fit in the hand. Oppo upped the material aspect of the design by adding a steel frame that provides flat edges for easy gripping. The Skyline Notification light from the Find 7 makes an appearance here but this time it is designed so that you can see the light from both the front and rear of the device. Sadly the LED is only blue as before. All design aspects aside, our favourite addition is the touch based fingerprint scanner on the back of the device surrounded by a metallic frame which seems to work like a charm in every demo video and requires no swiping. Making a return is the new and improved O-click remote. With the tiny accessory, users can control music playback and even use it as a camera shutter. The coolest bit about the remote is that it can be used to remotely control the motorised swiveling camera. You can either slowly control the swivel or cause the camera module to flip entirely with the press of a button. A great addition to the N3 is the VOOC fast charging which we saw on the Find 7. This time around, Oppo has shrunk the size of the charger making it much easier to use. On the software side of things, we have Color OS 2.0 which is based off of Android 4.4 KitKat. The update does not bring many visual changes but adds some new features. The N3 will release in the coming months in the white colourway starting at $649. No word yet on market availability. When the iPhone 6 came out, people thought it was too thin for comfort and questioned how much thinner could a smartphone possibly get. 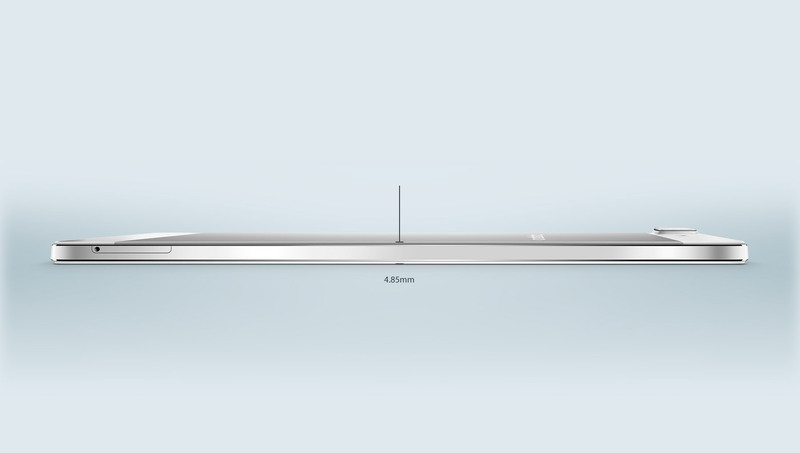 Oppo today answered that question with its follow up to the R3, the incredibly thin R5. The R5 is just 4.85mm thin, making it the world’s thinnest smartphone! The R5 is made of a metallic frame with nicely chamfered edges to maintain the thin profile. The build is great and should be unlikely for it to bend. The incredibly slim design is the marquee feature of the device and truly makes you wonder how much slimmer can a phone get. Slimming down the device so much does have its drawbacks as there is insufficient space for a headphone jack but Oppo will provide a micro USB adaptor to solve that issue. The camera module also sticks out a bit but it is a necessary sacrifice if you want good image quality and the tremendous thickness. Going so thin brings about some heating related questions. Oppo built the internals out of special phase shifting materials similar to those found in modern PC motherboards that absorbs heat and keeps the temperature at reasonable levels. VOOC fast charging is also available on the R5 which is a huge plus. Oppo even managed to fit a decent 2000 mAh battery inside! The Oppo R5 will retail for $499 in the coming months in gold, silver and grey.